The Redshift SM inside Classic Car Club Manhattan. The sound of a motorcycle is part of what makes a motorcycle, a motorcycle. It’s a key strand of DNA and if it were to go missing, what would that be like? Is it safe? Would anyone even want one? I went to the Classic Car Club of Manhattan last week and rode the electric no-noise, no-emissions Alta Motors Redshift SM to find out. 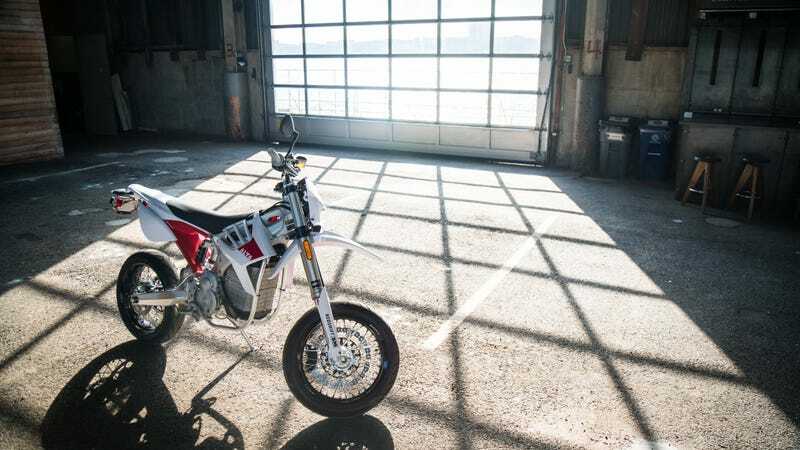 The Alta Motors Redshift SM, even though it’s electric, looks like any other motorcycle—an attractive one at that. I’m a sucker for white plastics, especially when they’re molded into Ferrari Testarossa-esque fins surrounding the frame. The simplicity of an electric motor is echoed in the design and overall presence of the bike. No flash, no bells or whistles, and I like that. The key is neatly recessed into the plastics of the bike. On the Redshift, operation couldn’t be simpler. After charging the bike in a 110 or 220-volt outlet (5 hours total charge time or 2 1/2 respectively), turn a small recessed key near the frame, flip the kill switch into run, press the “starter” button (a feature that I find hilarious and love), and your twist-throttle is live. There is no warm up procedure, no choke, no praying-your-bike-starts-this-morning ritual to practice. It just goes on, regardless of what kind of mood you or mother nature are in that day. The aforementioned black “starter” button on a fully-electric motorcycle. The red switch is the kill switch. If you’re the type of rider who loves to get his or her hands dirty and tinker, the Red Shift is not for you. Maintenance is hilariously simple. The break-in procedure suggests changing the synthetic gear oil, all 4oz of it, after the first 2 hours of use. Other than greasing your chain, that’s it. Forever. Greasing the chain is basically the only maintenance you’ll have to do on the Redshift SM. Leaving the Classic Car Club of Manhattan on a brand-new motorcycle that isn’t yours can be intimidating, especially since there’s a myriad of expensive supercars surrounding you. But on the Redshift, you don’t have a clutch or transmission to deal with, which makes riding a breeze. You also lose the exhaust, and that would have been lovely if I was riding through a park or desolate area. But I wasn’t. I was on the crowded streets of Manhattan, and that made me completely change how I stayed safe. I’m used to riding Harleys, and I always feel like drivers hear me before they see me. On the Redshift, I was worried drivers might notice me only when it’s too late. Where I rode became even more important when I was on the Redshift. The Red Shift SM parked next to CCC’s new Ford Shelby Mustang GT350. I should also mention the power, because there’s a lot of it. Twisting the throttle commands 40 horsepower and 36 lb-ft of torque from 0 RPM which means in the time it takes for the bike next to you to combust fuel, you’re already accelerating. There’s also four different maps for power delivery within a thumb’s reach—one being the most docile of the group, while four is geared towards competition. Since my ride was only a few miles long, I didn’t get to fully exploit all four modes, but Alta’s CEO tells me the most noticeable change is from modes one and two, for what it’s worth. The red “up” and “down” switches are how you cycle through the bike’s various maps. The best part about the Redshift SM though, is not how much power it makes, but how it delivers that power. Sure, if you twist the throttle aggressively, the bike will respond by lifting the front end. But if you twist it gently, the SM becomes a master of low-speed maneuvers that’s perfect for riding in a city. I felt this within ten feet of the car club, where normally having to juggle the throttle, brake, transmission, and clutch through priceless supercars would cause enough anxiety to forfeit the endeavor entirely. But with the Redshift, I could, and did, perform figure-eights around the cars without having to think about it. This bike is easy enough to ride for an inexperienced rider, while someone with more experience won’t find it a bore—evidenced by the size of the smiles on the “pro” riders who returned after me. It’s a motorcycle you can grow with—an extremely rare and desirable feature for someone shopping for a bike. As I sat at the last stoplight before returning, I noticed a faint buzzing, humming vibration through the handlebars and laughed—it was the sound of the electric motor, letting me know it was on. At that moment, I realized all the things I hadn’t noticed during my ride: radiant heat on my legs from an internal combustion motor, its resulting fumes, the vibration, the sound of an exhaust. The Redshift SM’s naked frame in the foreground, completed motorcycle in the background. What made me laugh even harder, is that I didn’t miss any of it.